Freedom Summer activists sing before leaving training sessions at Western College for Women in Oxford, Ohio, for Mississippi in June 1964. Miami Valley college students have joined forces with a statewide youth organization to commemorate the 50th anniversary of the Mississippi Freedom Summer. 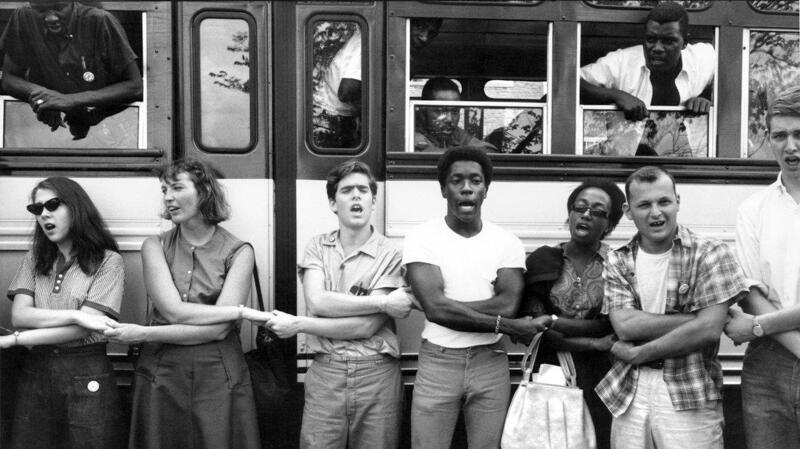 The group will make a trip to Jackson, Mississippi next week to honor the Freedom Fighters of 1964, students and activists who descended on the south from all over the country to fight for voting rights and other civil rights alongside black southern organizers. The students will represent the Ohio Student Association, which was formed two years ago to teach students how to become politically active at the state and local level. Member Tristina Allen, a student at Wright State, believes the work they'll be doing in Mississippi was started by the the Freedom Fighters. "We will be doing a large voting registration drive, mimicking the activity that they did 50 years earlier and registering people who aren't often voting and making sure that they do know that they have the right to vote," Allen said. In the 1960s, civil rights groups chose Mississippi to launch the Freedom Summer project because at the time less than seven percent of the state's eligible black voters were registered to vote. Local student organizer Prentiss Haney feels that voter suppression still exists there. "We have young people coming together fighting for voter rights," Haney said. "We see that the issues that were fought back 50 years ago are still happening today. So, we need to talk about what it is that we want as young people and what rights do we deserve." On June 21, 1964, Freedom Summer volunteers Michael Schwerner, Andrew Goodman and James Chaney were reported missing. They were found six weeks later buried beneath an earthen dam. While in Mississippi, Ohio Student Association volunteers and other youth groups from around the country will hold discussions about community organizing and voter suppression. Interview with Ohio Student Association volunteers.